Normal is so overrated. 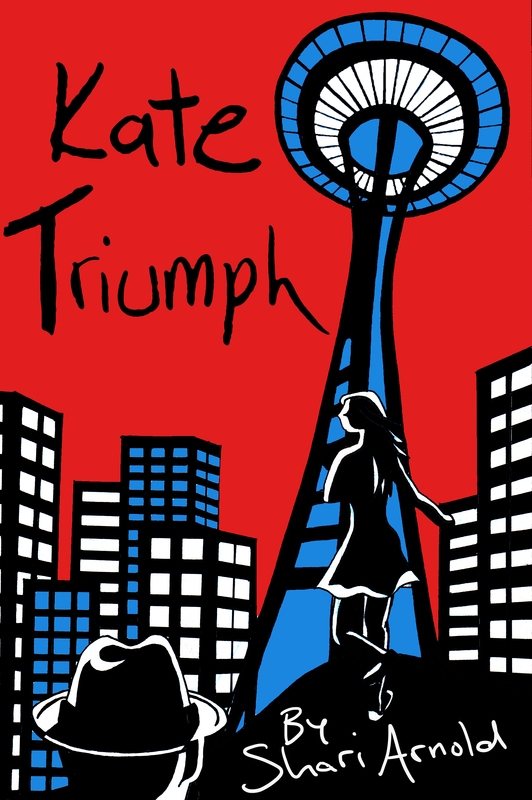 At least that's what Shari Arnold's protagonist in her debut YA novel, Kate Triumph, tries to tell herself. But why? You'll have to read it to find out--no spoilers here. That said, if you'd like a little taste of the action (there's plenty to go around! ), here's what Shari had to say when we sat down to chat about the story behind the story, how she balances writing and motherhood, and what's in store for the future. Kate Triumph is such an interesting name. What's the story behind it? SH: I was actually working on an entirely different novel when the name came to me out of nowhere. When I told my husband about it the next day he said, "She has to be a super hero." I agreed, but I didn't want her to be a tights-wearing, cape-swirling kind of super hero. After a few weeks of writing and testing out some ideas it finally hit me. What if James Bond had a daughter. Can you share a brief plot summary without revealing too much? SH: Kate Triumph has mystery and adventure, love, romance and a few car chase scenes as well. But mostly it's a story about a girl who is looking to find a place where she will be accepted and loved. And avoid the person who is trying to kill her. There are so many brilliantly drawn characters in this book and the plot is intricate. Did the ideas flow easily? Are the supporting characters based on people you know? SH: Once I figured out Kate I knew exactly how she would act in every situation. It did take a while to work her out, however. A few chapters in she made it very clear she was a lot stronger and tougher than I'd originally planned. My characters are rarely based on anyone in particular. I'm too much of a people watcher, so they're more like a mix of many different individuals. There are very convoluted relationships in the book--both romantic and familial. Which was your favorite to write? SH: I had a lot of fun with the relationship between Kate and her father; the trust issues, the secrets they keep from each other in the beginning. I loved how protective he was with her and yet he gave her a freedom she'd never had before. But for me it's always about the love story. The scenes between Kate and Zack made me grin for days. My favorite books to read generally have some romance in them so it only makes sense that I'd include it in my writing as well. How did you decide on the settings for the book? Are they places you've spent time? SH: There is a line Andrew uses when he's describing his reason for living in Washington State, and it's always been one of my favorites. "No one makes eye contact when the sky is falling." I've been to Seattle and Mercer Island and it just made sense that he would live there. There was never a doubt in my mind that the story should take place somewhere cold and rainy. Who are the authors you emulate? SH: I'm a huge fan of all things Sarah Dessen. Her characters could simply walk around doing nothing and I'd be hooked. I love when books make me laugh and Stephanie Perkins and Robin Benway are amazing at that. They also make me grin whenever I get to the kissing scenes. What are some of your favorite books you've read recently? SH: I read a lot of YA which means I enter into a lot of trilogies. The Throne of Glass series by Sarah J. Maas has completely hijacked my life and I couldn't be more obsessed with A.C. Gaughen's Scarlet series. Her Robin Hood got me thinking about other classic characters and led me to write a re-imagining of Peter Pan set in Seattle. You have two young children. How do you balance writing and motherhood? SH: I'm lucky that both my husband and I work from home. But even when I can't write every day I do brainstorm. I carry notebooks with me wherever I go so that I can write my thoughts down. When the story is flowing it's important to keep moving forward, but when the story is complete I always take some time off. SH: I'm currently working on the second Kate Triumph book and gearing up for the release of my next novel Neverland in the Spring.